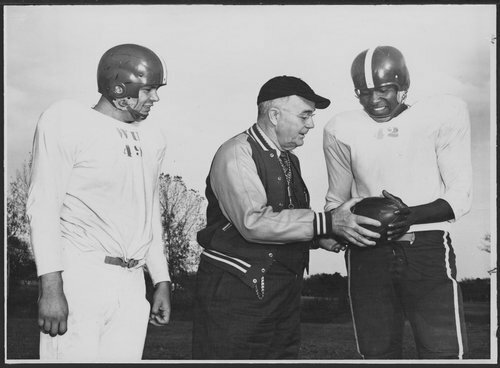 These two black and white photographs show William A. Smith with football players from Washburn University in Topeka, Kansas. The first photograph identifies from left to right LeRoy Harmon, William A Smith and Art Fletcher; a future GOP advisor and forthcoming leader of affirmative action. Smith, a Justice of the Kansas Supreme Court, (1930-1956), assisted young athletes with their continuing education by providing job opportunities in the private and public sectors.